Yesterday was Seward’s Day, an official state holiday commemorating the purchase of Alaska from Russia in 1867. Secretary of State William Seward brokered the deal though he was roundly chastised for the purchase, called “Seward’s icebox” and “Seward’s folly” until people ultimately realized the rich resources Alaska had to offer: oil and gas, minerals, timber, and fish… not to mention incredible beauty. Happy Seward Day! 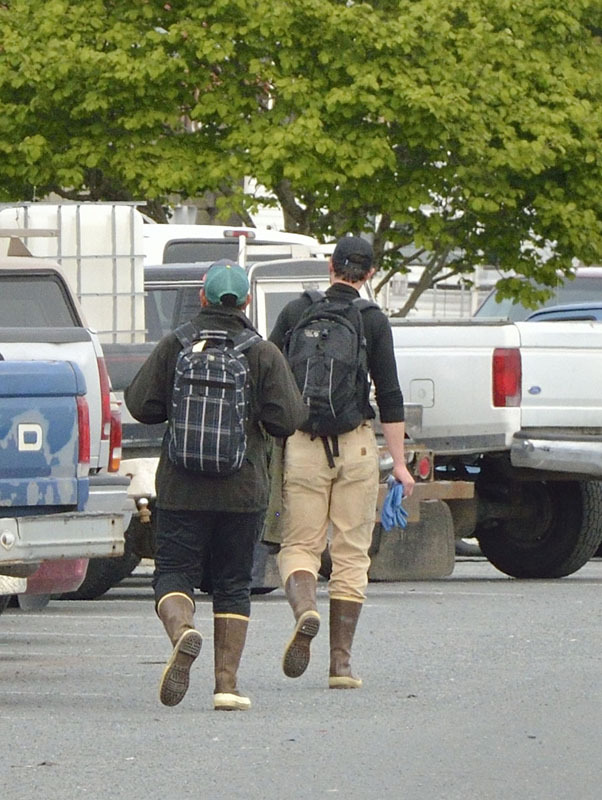 As I write about life in a small Alaskan fishing town, I would be remiss if I didn’t focus on the most important garment worn by coastal Alaskans – XtraTuf boots, aka “brown boots”, “Sitka sneakers”, etc. These boots are knee-high, usually made of rubber with a sturdy non-slip sole and everyone wears them, all the time. 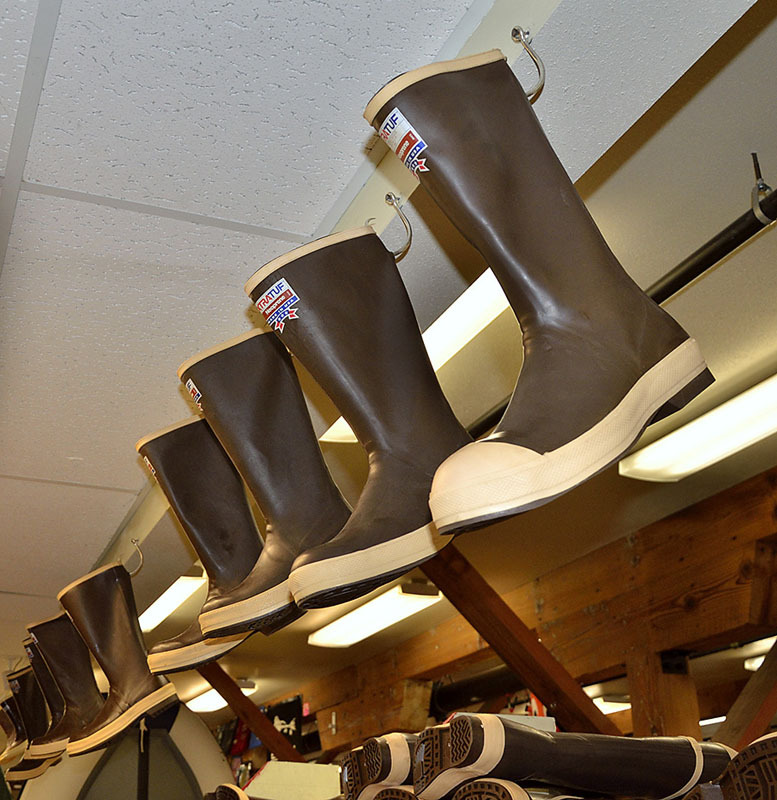 Fishermen, high school girls, little tykes… people even get married in them. We live in the largest temperate rainforest in the world so they’re great for trooping around town on rainy days, keeping warm and dry on the fishing boats, working in fish processing plants, hiking muddy trails… you name it. XtraTufs are very comfortable, and they come in sizes to fit the biggest fishermen and the smallest toddlers. There are even little crocheted baby booties made to look like XtraTufs called BabyTufs – it’s what any well-dressed Alaskan baby wears! 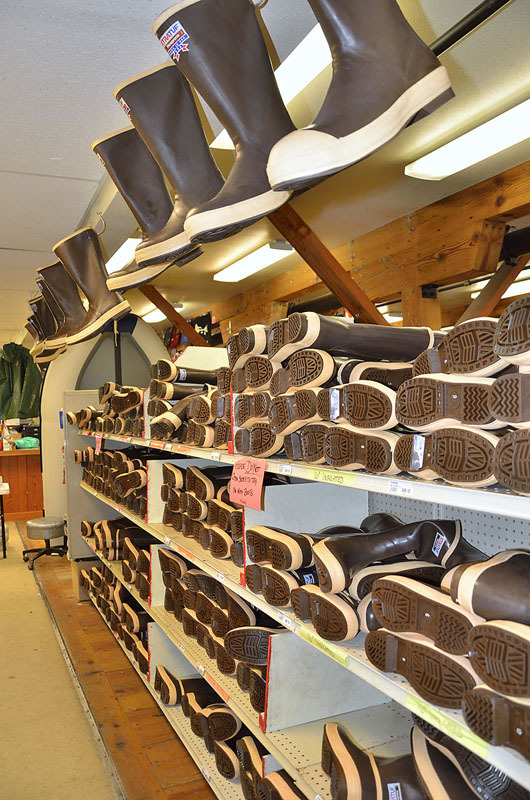 If you walk into any store in downtown Juneau or Ketchikan on a day that’s overflowing with cruise ships, everyone will recognize that you’re a local if you’re wearing your brown boots. (Actually, I wear Viking brand because they fit me better, but they’re still brown!) That’s part of the real Alaska… which brings me to something I just have to comment on: so-called “reality” TV shows about Alaska which are anything but. A gal from Petersburg was visiting friends in the Lower 48 recently, and someone asked her where she was from. When she replied that she was from Southeast Alaska, the questioner said “Wow, you’re so well-dressed and articulate for someone from Alaska!” Clearly the questioner wasn’t the sharpest knife in the drawer, but I wonder how much of people’s warped ideas come from so many of these garbage TV shows portraying Alaska as a haven for the most bizarre and moronic people on the planet. “Reality TV” has nothing to do with reality. It was a trend started when Hollywood had a writer’s strike and they had to come up with some other way to fill the airwaves. Instead of paying good writers, they found regular people who were willing to act like idiots for a fraction of the money. The producers of these shows continue to find new and more ridiculous situations, and they seem to be in love with Alaska. It’s a travesty! Look away!! There are two shows that really chafe the local population. One is “Alaskan Bush People” about a family who supposedly live in the wilds of Alaska on their own. They’re now living up near Hoonah, pretending to survive in the “wild bear-infested woods” when in fact they live in the Hoonah Lodge with the Discovery Channel crew and just go out to some nearby land (leased for them by the production company) for their play-acting nonsense. Meanwhile they await trial on fraud charges from the state. Petersburg locals were quite irritated to find that the Bush People and camera crew were in our town for a day recently to film something. No one wants those nut-jobs anywhere near us! Another show – “Battle of the Bay” depicts gillnetting in Bristol Bay, and has so mis-represented reality that the Sea Grant office of University of Alaska – Fairbanks here in town posted several pages of single-spaced points explaining how the show grossly warps reality. I’ll climb off my soapbox and go back to the eagles and ravens and mountains now. The fish processing plants are wrapping up winter renovations, and the airports are getting busier with fishermen and processing workers starting to come north for the season. Daffodils are up and spring is in the air. It’s a drizzly day today so I’m going to don my brown boots and head up the dock to run some errands around town. So you’re back in SE? Loved your soap boxing. Sounded like DF rendezvous went great & next one already set up with an exotic location! We were very excited to read in recent newsletter of new member, Chuck Mauch, looking for a wood DF! Sounded like ideal person for PH II!! Jim emailed him but has heard nothing back. He will call him next week. Had left hip replaced today & doing much better than we both expected, walked 75′ 3 hrs. after surgery! I’m his coach so go to joint camp with him tmw., has to learn how to navigate our indoor stairs before they will release him, Fri. we hope. At least I got out of Easter dinner! Happy Easter to you! Loved your comments on reality shows. 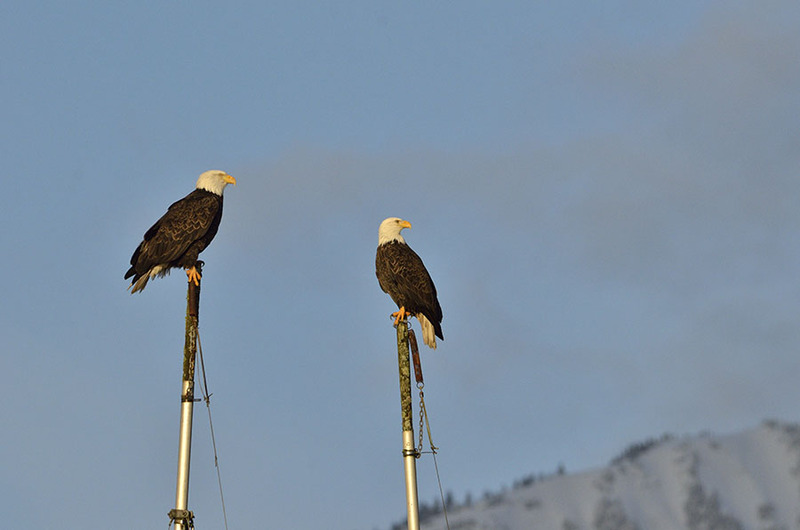 Have you heard anything about “Alaska: The Last Frontier”? We understand that the family is that of the singer Jewel, who did not agree to take part but did sing the theme song with her dad. Makes you realize that their struggles are, perhaps, not as life-and-death as they are portrayed. Still loving reading about your adventures. We are now hoping to be back at the boat by the middle of May, and to be back at NY Harbor about three weeks later, ready to head north from there.